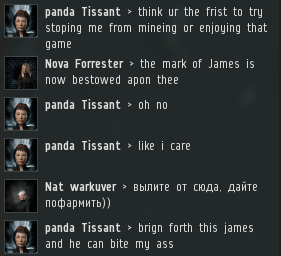 Previously, on MinerBumping... As a rite of passage for The Knights of the Order corp, Agent Nova Forrester dedicated herself to bumping non-compliant miners in the Kamio asteroid belts. In no time at all, Nova's efforts were rewarded with a permit sale. Nova reported her success in selling her first permit of the day--and was met by the jeering of a miner who lacked the purchaser's good sense. 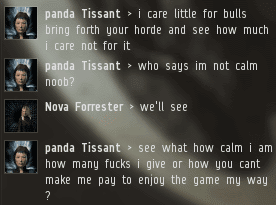 Indeed, panda Tissant had done nothing but complain ever since Agent Nova arrived in the system. She seemed to be waiting for Nova to leave so she could resume mining. Though obviously anti-Code, panda declared herself neutral. However, when it comes to the Code, there is no such thing as neutrality. This has been established by long-standing precedent. When it became clear that Nova wasn't leaving any time soon, panda returned to the asteroid belts--only to be bumped out again. The miner was forced to retreat, but tried to save face. Since the earliest days of the Code, miners have responded to bumps by docking up in disgrace--while pretending their ore holds were "full anyway". 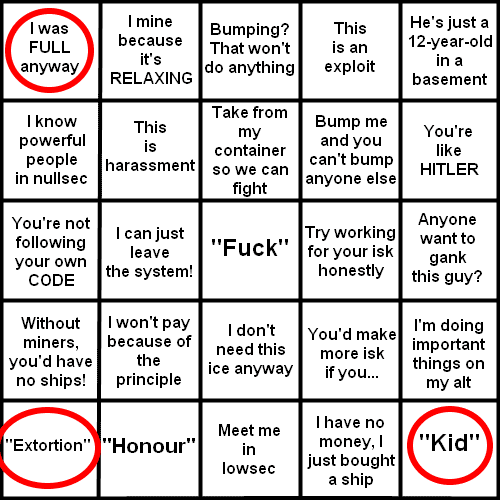 panda thus checked off the "full anyway" square on the Miner Bingo card, along with two other corner squares. 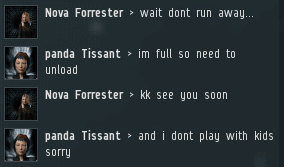 panda's killboard confirmed that she was one of countless carebears who returned to highsec after finding nullsec unsatisfactory. 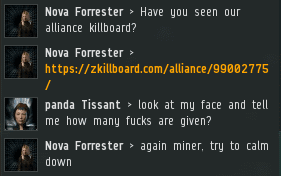 Our Agent tested the miner by placing a bounty of 315,315 isk on her head. panda's wickedness came right to the surface. The blockade of the Kamio asteroid belts continued. 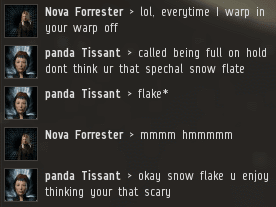 In theory, panda could have tried to mine in a neighboring system. Instead, she remained in the station to stew in self-pity. By this point, it should have been apparent to panda that she needed to buy a permit. Yet she couldn't bring herself to admit it. Time passed. Nova monitored the pristine asteroid belts, only to occasionally spot panda trying to sneak a little ore. By sheer coincidence, panda's mining vessel became "full" each time Nova appeared. Oblivious to what had been happening in Kamio, another miner logged on and started mining. He was shocked to find himself being bumped out of the belt. 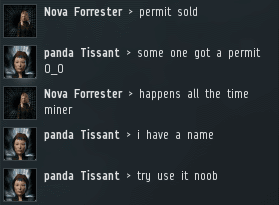 If panda couldn't successfully gather ore herself, she could at least coach a fellow miner in how to rebel against the Code. Could this be the start of a full-scale uprising? Mining was buffed a while back to allow for partial yield from interrupted cycles. Still works for ice though since one cycle is one block. These miners sure are vile. It's almost as though they want to be hated. 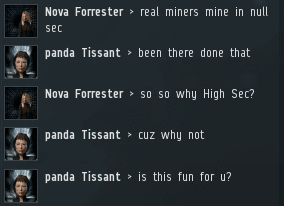 It's impossible to truly prefer highsec mining after experiencing the thrill of nullsec. That's just an excuse to rationalize failure. Dont matter Kenny, you still never elite until you join us in rust. "keep movieing he wont be eble to bump u"
OK. On another note, I read the shareholder voter story - a little before my time, it should be said. It would however be fun to see a resurgence towards this method of dealing with wayward miners! 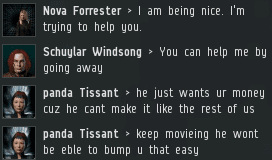 A highsec miner couldn't find his way through a maze even if the rats helped him. Miners can't work together because each one of you is bigger snowflake than the last, incapable of leading or taking direction. You can't coordinate because half of you are AFK at any given moment. 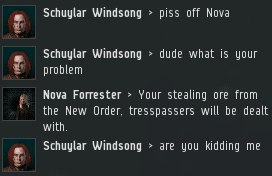 If a miner ever tried to rise up he wouldn't get five systems before his veldspar craving took over. You are a willing slave to your own monotonous impulses. Panda should have gotten a permit. Panda should have become elite Kenny. When you and your friends gonna become elite Kenny? panda will NEVER PAY FOR FREE CONTEN!!! I sent screenshots, and an explanation of Kennyanon's butthurt, to Soup in his Discord. He laughed and said "only an aspie would use that out of context". Wow you would think he would be ok with some asshat plugging his content and giving him some extra views. If some crying fool advertised my videos and helped me get money I'd say let him cry. Kenny thinks he is a god.